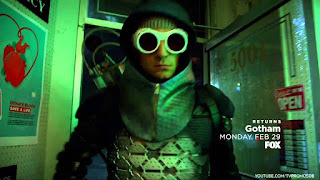 We open a month after the events of the mid-season finale, and Gordon has returned to Gotham to give his story to the District Attorney’s team to clear his name of his past crimes he was accused of, even though he was the one who killed Galavan, and ask him if he knows the location of Penguin. While the DA lifts all charges, Captain Barnes believes that Gordon not only killed Galavan but is hiding the Penguin. While some would argue that Gordon should be the upright detective the city deserves, I do enjoy this version of a young Gordon, who is adapting to the darkness of Gotham, but still has the good in him that will push through in the end. 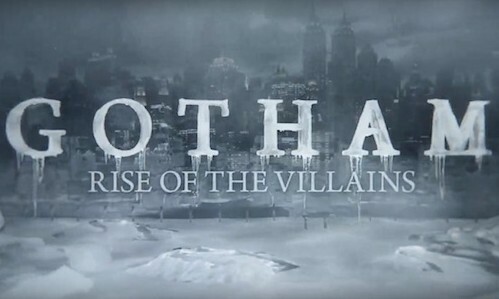 We then head across Gotham to meet the villain of the episode, Victor Fries, and his WIFE WHO ISN’T FROZEN YET! That’s right! We finally get Victor and Nora scenes pre-accident and those scenes were some of the highlights of the episode. Victor helps his wife take her medicine before heading downstairs to check on his experiments on people he’s abducted. As he isn’t a full medical doctor in the show, his experiments are on the freezing process for humans and how they can come back after being frozen...and this leads to disgusting show moment number 1. Victor brings out one of his frozen captives and starts the thawing process...it goes well for about 10 seconds...and then the guy melts. I don’t even mean just instantly a puddle, I mean, fingers deflate, eyes melt from head, skin turns greyish green as it melts down...it’s disgusting, I almost threw up. The day after, literally just after commercials, we see Nora physically sick, hunched over, coughing up blood, having to take different forms of medicine. Your heart feels like it’s gonna break, even though you know how this song and dance goes. The actors playing the Fries’ are both spot on, and play off each other well. If the episode wasn’t obviously just a two-parter, I would love to see them more. Victor then robs a pharmacy for Nora’s medicine, which leads to him unleashing a new version of his freezing chemical on a Jerk Pharmacist... I’m not saying he deserved it, but he did. Meanwhile, our favorite bird-like villain Cobblepot was arrested and is declared insane which means he’s Arkham’s newest inmate. He tries to establish dominance by standing atop a cafeteria table and declare himself the king of Gotham… except unlike him, the rest of the inmates are insane, so they just copy him to mock him. 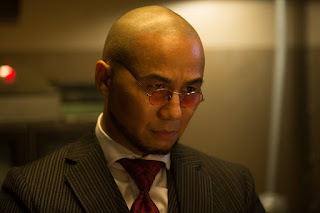 This act causes Hugo Strange to want to meet with his newest patient...B.D. Wong nailed it. That’s the short version of it. The long version of the portrayal: Wong was able to pull off the creepy calculating nature of Strange in a subtle way. He didn’t act over the top, or stereotypical mad scientist, he was able to make himself feel like a regular psychiatrist, but then act creepy as all hell when he needed to be, especially when he was pointing out the whys of Cobblepot’s anger. After Cobblepot is done with Strange, he tells him that “Rehabilitation” begins in the morning...then we see the rehabilitation...in the form of an Arkham inmate scratching out his own eyes… Ladies and gentleman, Disgusting show moment number 2! Back with the main plot, Victor brings his latest victim, the jerkbag pharmacist, home to see if he can be revived. As he went to hide his getaway van, she sees what he’s been doing. The police arrive after finding Nora’s empty medicine bottle, and with Nora in shock gets taken away, trying to justify her husband’s actions… Yeah no, he melted a man… and kidnapped many others… Yeah no justification for that. In the end, Victor learns that his recent formula, the one used on the jerk pharmacist, was a success and now he can freeze people and bring them back...he’s now preparing for the big chill with his wife… all while Strange plots for his capture. Season 2 continues to be on a roll for Gotham as we now have Mr. Freeze and Hugo Strange stepping into the light. The episode is dark, yet is willing to embrace its comic side as the world gets stranger. While I did like both stories this week, I’m looking forward to Oswald’s new story arc as he is now thrown into the terrible clutches of Arkham’s chief psychiatrist. Victor is cool(HA!) but if he’s like Jerome he won’t be around for long.